HowMechanismWorks ? : What Is Detonation ? 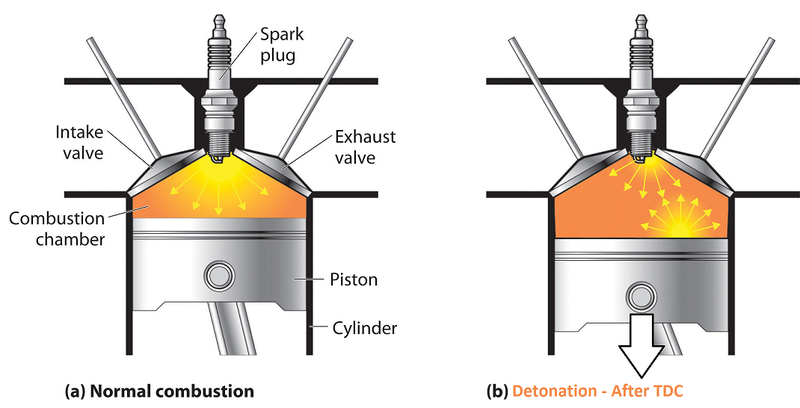 What are the Harmful Effects Of Detonation In Engine ? What Is Detonation ? What are the Harmful Effects Of Detonation In Engine ? Detonation (also called "spark knock") is an erratic form of combustion that can cause head gasket failure as well as other engine damage. Detonation occurs when excessive heat and pressure in the combustion chamber cause the air/fuel mixture to autoignite. This produces multiple flame fronts within the combustion chamber instead of a single flame kernel. When these multiple flames collide, they do so with explosive force that produces a sudden rise in cylinder pressure accompanied by a sharp metallic pinging or knocking noise. The hammer-like shock waves created by detonation subject the head gasket, piston, rings, spark plug and rod bearings to severe overloading. Mild or occasional detonation can occur in almost any engine and usually causes no harm. But prolonged or heavy detonation can be very damaging. So if you hear knocking or pinging when accelerating or lugging your engine, you probably have a detonation problem. Knocking produces a loud pulsating noise and pressure waves. These waves vibrate back and forth across the cylinder. The presence of vibratory motion causes crankshaft vibrations and the engine runs rough. (a)High pressure waves generated during knocking can increase rate of wear of parts of combustion chamber. Sever erosion of piston crown (in a manner similar to that of marine propeller blades by cavitation), cylinder head and pitting of inlet and outlet valves may result in complete wreckage of the engine. (b) Detonation is very dangerous in engines having high noise level. In small engines the knocking noise is easily detected and the corrective measures can be taken but in aero-engines it is difficult to detect knocking noise and hence corrective measures cannot be taken. Hence severe detonation may persist for a long time which may ultimately result in complete wreckage of the piston. Detonation results in increased carbon deposits. Knocking is accompanied by an increase in the rate of heat transfer to the combustion chamber walls. The increase in heat transfer is due to two reasons. The major reason for increased heat transfer is the scouring away of protective layer of inactive stagnant gas on the cylinder walls due to pressure waves. The inactive layer of gas normally reduces the heat transfer by protecting the combustion and piston crown from direct contact with flame. Due to increase in the rate of heat transfer the power output as well as efficiency of a detonating engine decreases. Increase in the rate of heat transfer to the walls has yet another effect. It may cause local overheating, especially of the sparking plug, which may reach a temperature high enough to ignite the charge before the passage of spark, thus causing pre-ignition. An engine detonating for a long period would most probably lead to pre-ignition and this is the real danger of detonation.